More than 350 representatives from the U.S. Air Force GPS Wing, the GPS III contractor team — along with user communities from the Department of Defense, Air Force Space Command, the Department of Transportation, and the Federal Aviation Administration — participated in a four-day (August 16–19) space vehicle (SV) CDR at Lockheed Martin Space Systems Company’s new Patriot Center in Newtown, Pennsylvania. The program’s most significant milestone to date, completion of the SV CDR validates the detailed GPS III design as meeting military and civil requirements. It marks the culmination of 65 individual assembly, subsystem, element, SV, and system-level CDR reviews and validates the overall design maturity of the GPS III Space Vehicle and allows Lockheed Martin to enter the SV production phase. 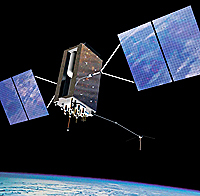 GPS III is intended to improve position, navigation, and timing (PNY) services and provide advanced anti-jam capabilities with three times greater accuracy than current GPS spacecraft and up to three times more power for military users. Block III satellites will also carry a new civil signal (L1C) that is designed to be interoperable with other GNSSes. “Working in partnership with the Air Force, we look forward to building on our momentum to achieve our customer’s cost, schedule, and performance requirements for this essential program,” said Joe Trench, Lockheed Martin’s vice president of Navigation Systems. Trench recently succeeded Don DeGryse, who has moved to a vice-presidency with Lockheed’s Surveillance and Navigation Systems operations in Denver, Colorado. Lockheed Martin Space Systems, along with teammates ITT of Clifton, New Jersey, and General Dynamics of Scottsdale, Arizona, is working under a development and production contract awarded in May 2008 and worth up to $3.568 billion if all options are exercised. Lockheed’s immediate award is for $1,463,969,301 to build two R&D GPS III satellites, with an additional five options of two space vehicles (SVs) each, for a possible total of 12 SVs. The team is on track to launch the first GPS IIIA satellite in 2014. The GPS III satellite components will be built and tested in an 18,800-square-foot high-bay addition at the west end of Lockheed’s new Product Team Building at its Newtown campus. Opened in a ribbon-cutting ceremony last month (July 1) the new facility expands the company’s satellite manufacturing capability, housing a near-field antenna range and antenna assembly clean room for manufacturing of GPS components and a passive inter-modulation chamber to test the frequency bands of the components. Final assembly, integration, and testing of the satellites will take place in Lockheed’s Waterton Facility in Denver, Colorado. Gruber took part in the Newtown ceremony less than two weeks into his new assignment at the GPS Wing, part of the Space and Missile Systems Center at Los Angeles Air Force Base, California. Headquartered in Bethesda, Maryland, Lockheed Martin employs about 136,000 people worldwide and reported 2009 sales from continuing operations of $44.5 billion.